4 years of Shop Notes. I love this subscription, great pics and projects with plans. Very little advertising, while I understand the importance of advertising sometimes magazines tend to have just a little to much for me. The subscription comes with the 3 ring binder holes in them so you can place them in a binder. I would give it 6 Stars if available, thx for reading and I hope this helps! I have every issue of ShopNotes and its probably my favorite of all the woodworking magazines. When I first got serious about woodworking I relied on these magazines to learn the craft. Like you said ShopNotes is not filled with adds and they always have great plans for jigs and shop items. I don’t think there is any advertising except for making it known were things like hardware, etc. can be purchased for the various projects in their books. Those are cool binders… I put mine in special magazine holding boxes I made some time ago. Thank you, that is something to think about. Terry and the boys are awesome! When i got serious about my woodworking i started with their magazine as well. I liked the idea of NO advertising! It was great and i had it for about 2 years worth. I thought it was kinda cheesy though that every picture of a pair of hands was of the same guy lol…Just because he had, nice hands. If i remember correctily most of thier projects where for the shop, which at the time, was fine with me. I now subsrcibe to the e-version of Fine woodworking though because of the more interactive website. in my top three, probably top 2. i have been known to buy past issues of woodworking in bulk off ebay. although shopnote owners tend to hang onto their copies. I love shopnotes also. 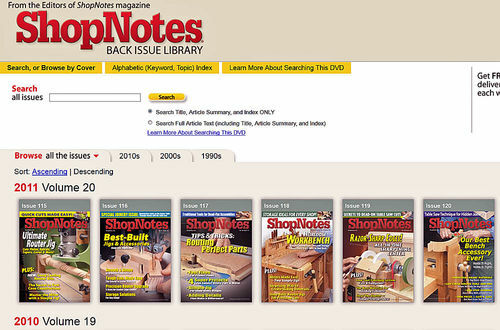 I have 1-95 digital PDF’s of shopnotes right now. I don’t have the past couple of years on pdf though. Shop notes is VERY helpful when setting up a shop and if you already have a shop very helpful. I’d love to have a full set of PDF’s for all of the issues. I’ve got the paper copies of 1 thru 35 or so that someone gave me. But it would be nice to flip the pages on the computer. You can also print a copy of the article if you want to make it. For those of you that would like to see Shop Notes in pdf format and all of the back issues available on one DVD…well, it is out. I posted a simple review in the DVD section. Screen shot of the DVD main screen. Is there a Search that covers ALL files at the same time? ie: Can I Search ALL issues for “Router Table” and get results covering all 25 years with ONE Search? Yes. Read my review. I posted the link. @Joe Lyddon…her ya go, Joe. I searched all issues and found 91 articles with “router table” in the title, article summary, etc. First hit was in 1995. Things like tips for router table use, how to make router tables, drawers grooves, etc. Here is a screen shot of the search results. All I did was type in the words “router table”.